Today, I wanted to try out running a Python application in IBM Bluemix. And I wanted to check out weather reports for some possible weekend destinations. Why not combine it? 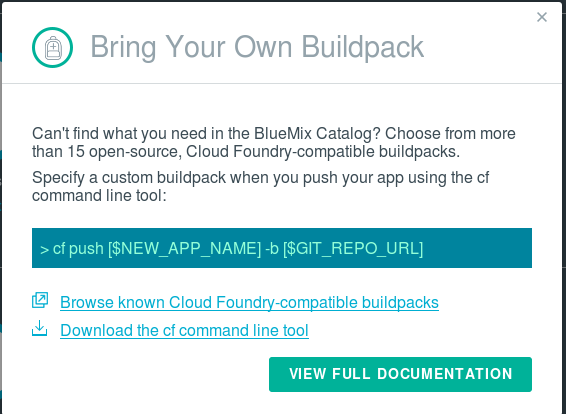 Because IBM Bluemix is based on Cloud Foundry, I am using the Cloud Foundry-related tools (mainly "cf") to interact with Bluemix. A first challenge is that a Python runtime is not built into Bluemix/Cloud Foundry and I have to tell it to prepare the runtime for me. It is called "Bring Your Own Community". When you click that icon, some helpful description comes up, pointing you to how to get started. Weather looks nice, I learned more about IBM Bluemix and how to use Python today. Now it is almost time for the weekend. There are follow-up articles to this one describing how I enabled a custom domain for my Bluemix application and how I added a Cloudant / couchDB to my Python application on Bluemix. While working in your office a rare visitor from another location stops by. Time for a break to connect on the latest gossip, but not too long. On the way back to your office your boss asks you to call someone from the client team to clarify some technical issues and you have to squeeze it in between two important customer calls. And you just received a text message that your wife cannot pick up the kids and you need to leave on time this afternoon to do it. Workload Management (WLM) in real life. Everybody seems to be doing WLM, some better, some not so well. And there are many unwritten rules. A "fair" allocation of time and resources between different work items/applications is needed ("work / life balancing"?). Response time for critical tasks or some type of work is important and needs to be protected against less important tasks ("your mother-in-law visits, take care of her"). Implementation of rules to control and regulate the system behavior ("kids in bed by 8pm means time for you to watch soccer"). Deal with rogue queries that threaten regular operations ("kids bring over the entire neighborhood"). The system (sometimes) is overloaded and you have to set priorities ("no party this weekend"). All this can be done with the DB2 Workload Manager. It allows to identify different types of activities (work), manage them based on rules that govern available resources and set controls, and to monitor the system behavior. The database workload manager can be integrated with the operating system (OS) workload manager on AIX and Linux. This is especially useful when more than a single database is active and resources need to be controlled on a higher level ("sync your family calendar with the grandparents"). Does Workload Management help? Yes, it does. However, similar to family life it is possible that because of resource shortage not all planned tasks can be performed. Maybe time for an upgrade ("hire some help, do not get more kids... :)"). Currently, I am taking a look at IBM's new Platform-as-as-Service (PaasS) offering code-named "Bluemix". Right now it is in open beta and I signed up on its official website http://bluemix.net. Bluemix is based on the open source Cloud Foundry. But how do you get started and get a good introduction to what is offered? I read the article "What is IBM Bluemix?" on IBM developerWorks. It gives some background information and details that Bluemix offers Development Frameworks (develop in, e.g., Java, Ruby, or Node.js), Application Services (DB2, MongoDB, MySQL, and others), and Clouds, i.e., you can deploy your applications (apps) to public, private, or other clouds. Next, I watched the following video which gives a nice overview about the different elements of the Bluemix user interface, including the dashboard. Equipped with that background information and knowing about the UI, the next stop is the Bluemix website offering articles and sample code. One of the examples is on how to build a simple business intelligence (BI) service using Ruby and based on DB2 with BLU Acceleration, code samples included. If you haven't tried it yet, you can still sign up for the free beta here: http://bluemix.net. Enjoy! DB2 Screenshot Quiz: Where is this taken from? Let me know by comment or direct email. Some of the advertised improvements in the recent DB2 10.1 Fixpack 4 apply to the long existing tool db2look. Two new options have been added: "-createdb" and "-printdbcfg". The first is used to generates the CREATE DATABASE command and its options, the second to generate statements to reapply the database configuration. -- the current values in the source database. -- if you want the DB2 database to automatically adjust them. Right now the enhancements are only available in the just recently released fixpack of DB2 10.1. As with other improvements, I would expect it to be available for the newer DB2 10.5 release soon.